With the Mariners second round pick they picked Austin Wilson, an outfielder from Stanford. There are some people that will tell you he needs to overcome the “Stanford hitter stigma.” It’s possible, I guess that there is something instructionally wrong going on at Stanford, as recent years have bestowed the following players on the majors: Carlos Quentin, Jody Gerut, Joe Borchard, John Mayberry, Ryan Garko, Michael Taylor, and maybe some other guys I can’t think of or don’t know about. Of course, all of those guys reached the majors, despite most of them being enormous disappointments. The best parallel for Wilson is Taylor, who is also 6-5 and weighs in the mid-200s. There’s never really been a doubt that Taylor could remain at an outfield position; but his body may have led to swing issues. A pretty good argument could be made that Wilson has a higher ceiling than the Mariners first round pick D.J. Peterson, who doesn’t have a set position at this point in his development, though Peterson’s bat will probably always be better. What the Mariners may have done in with these first two picks is to add outfield prospects to a system that may have been looking at moving Dustin Ackley, Nick Franklin, or Brad Miller to an outfield spot in the future. 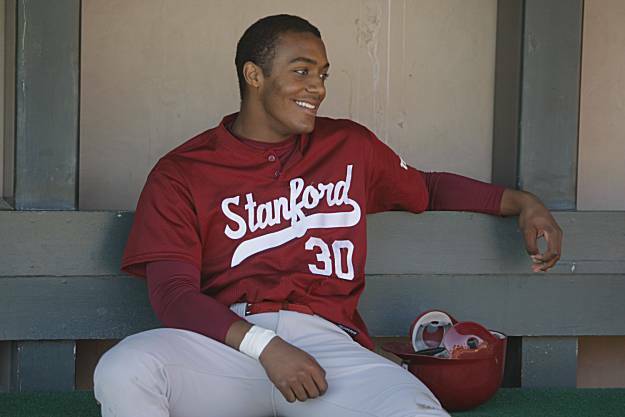 A handsome, linebacker-like outfielder from Stanford, Austin Williams is one of the premium offensive prospects available in the 2013 MLB Draft. Williams passed on the Cardinals out of high school, electing to attend Stanford instead. As a college hitter, he’s shown exceptional discipline and on-base ability (almost .400 in his sophomore year), coupled with good speed and developing power that hasn’t yet translated into light-tower shots, but probably will. With a strong college performance near the end of the season, he could be drafted in the first six rounds. In every draft class you usually have your “tools” players, and then you have your college players – those two things typically aren’t mentioned hand in hand. College players are usually the finished products where you know exactly what you’re getting and projecting them may not be all that exciting. But, sometimes you get the best of both worlds, the college polish and the tools. That’s exactly what Stanford’s Austin Wilson offers to scouts in this draft class. To be fair, his college career hasn’t [gotten] him close to a finished product like someone like Kris Bryant or D.J. Peterson, but his tools have developed to a point where the performance is beginning to catch up with his tremendous upside. Hey he looks good, could be maybe. Stanford is a great school (used to live in Palo Alto) but has something of a reputation of messing up hitters and pitchers, although I’m unsure of the veracity of such opinion. We can use some OF depth for sure. I still think one of the three will be moved to the outfield at some point, if all are still here. If Franklin gets traded again tho, maybe not. My fantasy is that the Ms trade Walker, Franklin and Paxton for Tulowitzki, Acklet becomes at least a respectable 7-9 hitter, and Miller becomes a leadoff center fielder. I doubt Colorado would trade Tulo for that package, even if the Ms ate his whole contract, he’s the face of their franchise. Add Romero and Morban and you might get Stanton. Well yeah there would be some more to the package. Not sure about it being Romero and Morban tho. There had been rumors of them at least taking to teams about him. Just because he is the face of the franchise doesn’t mean they won’t trade him. Their top spec is a shortstop, while try have zero pitching. The package for Upton was reported as Walker, Franklin and a couple relievers. Add Paxton and a lesser guy to that and it shouldn’t be that far off. But like I said, I don’t think it will happen. It’s just what I want.